Frazzled? Living a type-A life within a short drive of a cruise port? Have I got an antidote for you. Take a cruise that goes to places you’ve already seen from the nearest port. Carnival Cruise Line’s Elation sails from my hometown of Jacksonville, FL. 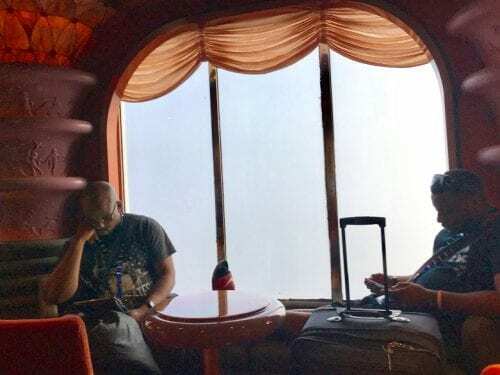 A friend and I recently celebrated our February birthdays by taking one of those short Bahamas cruises: out on Thursday, back Monday morning after a short stop in Freeport, a day in Nassau and a day at sea. 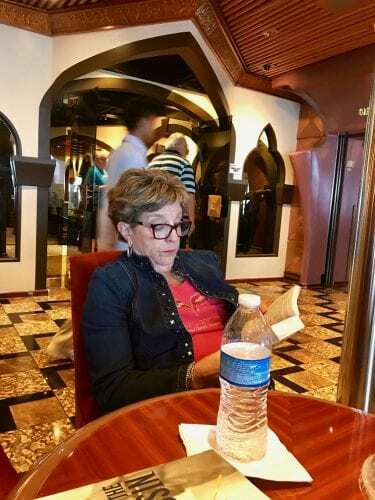 Our bags were packed with books and cards as well as clothes and our carry-ons each contained an unopened bottle (up to one-fifth) of our favorite liquor that Carnival allows passengers to bring aboard. Best of all, a friend offered a ride to and from JaxPort, eliminating parking fees. 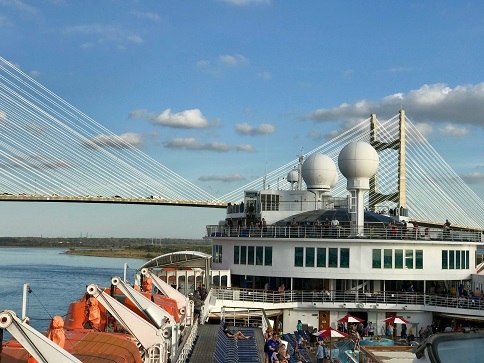 Tip: If you are driving from out of town, many of Jacksonville’s airport hotels have a stay, store and shuttle program for cruisers. When we arrived at the port, lines to board a cruise expected to leave at 4 p.m. were long, very long. Seems Elation had encountered dense sea fog and had to wait for it to clear before entering port. Made for an annoyingly long wait, but staffers were nice and we all eventually reached the gangplank and our cabins. Bags came later so we headed to the public areas. Once the ship began moving we were fascinated looking at our city from a new angle. We had taken boats through the river to the Atlantic, but never at this height and thoroughly enjoyed seeing the shipyards, riverfront homes, Mayport Naval Base and the jetties anew. Passing under the Dames Point Bridge was an ooh-aah hold-your breathe moment. Unpacking was actually fun, especially after our steward Alexander brought ice and we broke out our cocktail ingredients. There really isn’t a dress code aboard Elation beyond shoes and shirt inside by day, pants or skirts rather than bathing suits at night, but we were on vacation and decided to spiff up for dinner. There are two identical main dining rooms and menus, which makes for a slightly more intimate atmosphere. The food is good, ample and nicely plated. Each area has a service team of four and ours, led by head waitress, Leriak, was excellent. 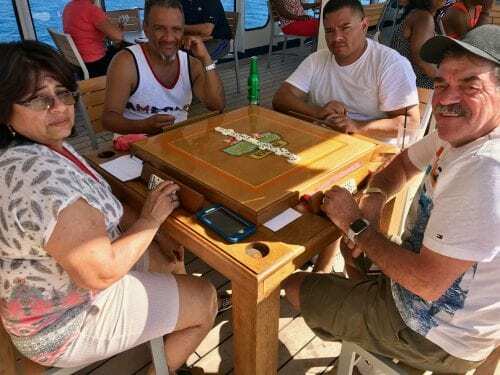 The next morning we snagged a table on the Lido deck near the Red Frog Rum Bar and broke out the Canasta cards. While others sunned and napped, we played with fervor. We paused about 10:30 and ordered one of Latoya’s excellent Bloody Marys, played some more then replaced cards with books. We tried Tifany’s, the buffet restaurant, liked the salad bar, but found we preferred mixing it and the occasional hot item with the burgers or burritos from the small spots outside. 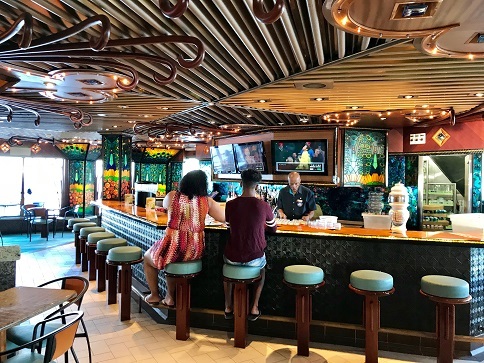 It was fun watching cruise ships back into their slots at Freeport, but having already experienced what the island had to offer, we ambled through the seen one-seen all offerings of the dockside shops in about 30 minutes and returned to our home afloat. Thus we set the pattern for our days. Omelet for breakfast, no hurry to disembark in Nassau either, a walk through downtown for a bit of retail therapy, cards, books, a Bloody Mary and repeat until lunch followed by a short nap, cocktails in the cabin, dress nicely for dinner, catch a show or two, roam the shops, specialty clubs and donate our allotted limit to the Casino. Somehow, between exploring the ship and going up and down stairs, we logged healthy quotas of steps. All in all, we indulged, relaxed and enjoyed ourselves without stretching, much less breaking, the budget. As we approached Jacksonville Monday morning, the sea fog made pea soup look transparent. Many passengers – we all were gathered in public areas for debarking – paced, complained, fretted and paced some more. We calmly pulled out our books and read, content to use the time to continue into our stories. After about an hour we looked at one another and smiled. Mission accomplished. Cheaper and certainly more pleasurable than sessions with a therapist or life coach and not a fret or frazzle in sight.